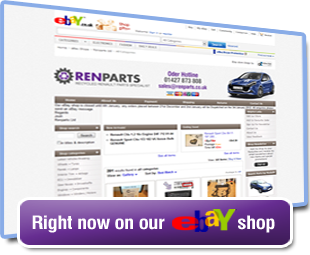 Renparts was born from the long established and well known Cliospares Ltd, specialising in parts for Renault Clio vehicles. We decided we should put our knowledge and enthusiasm of the Renault Brand and expand the business to cover all models. This was the beginning of Renparts. To be able to accommodate the amount of stock we would need to carry to satisfy our customers needs, we would need more space. The move began to our 10,000sq ft all indoor facility, the decision to make the operation all indoor was for two main reasons. These were to have 95% of the parts already on the shelf, cleaned, tested and ready for immediate dispatch, our state of the art electronic warehouse racking system allowed us to do this. The other was to ensure whatever the weather it wouldn't affect the efficiency of our dismantling and dispatch system. Our Clean indoor operation means minimum impact on the environment. Whether you order parts for delivery or collect your parts at our trade counter we are committed to offering you excellent customer service. Our knowledgeable team has access to Renault main dealer level compatibility checking on all parts, ensuring you are supplied the correct part first time, every time. All our parts carry a warranty, which can be extended up to 3 years.